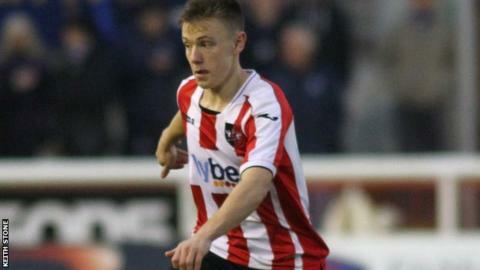 Exeter City have handed a professional contract to young forward Matt Jay, keeping him at the club until 2016. The 17-year-old is a second-year scholar at the club's academy and will officially take up his professional deal in the summer. Jay has made two first-team appearances for the Grecians, making his debut against Wycombe in the Johnstone's Paint Trophy in September. "I'm over the moon - I can't say I was expecting it yet," said Jay. "I've been working hard and I've kept doing what I do, and I was expecting that at the end of the year, when players normally get a decision, that I might have done enough. "So it has come as a surprise and I'm really grateful for it. "I'm grateful to everyone - to my mum and dad for running me around, to the lads I play with, and to all the coaches I've worked with at the academy such as Kevin Nicholson last year and Lee Skyrme this year, who have been a massive help. "I'm just so grateful to everyone that has helped me out." Jay made his Football League debut against Southend in November and earned rich praise from Grecians boss Paul Tisdale. "I made the decision to play Matt Jay and I thought he was wonderful," he said at the time. "He was probably our best player in the first half and he got his selection on back of performances in training and under-21 games."